Bernadine Nielsen encourages her four children to get their eyes checked every year. The 41-year old Regina-based mother and student knows all too well the perils of neglecting eye health. Nielsen went blind after developing eye inflammation at the age of eight. Growing up on a Cree reserve in northern Saskatchewan with her parents and six siblings, there was no easy access to medical care. Driving to see a doctor of optometry took six hours, but Nielsen to this day wishes the local nurses had encouraged her to make the trek. When Nielsen started experiencing symptoms of iritis, a painful condition that causes an inflammation in the iris of the eye, she wasn’t taken to see a doctor of optometry until her vision got worse, despite the fact that the condition ran in her family. Without medical care, Nielsen’s eyes burned, her vision became cloudy and she became extremely sensitive to sunlight. When the little girl finally made it to see a doctor of optometry, it was too late to preserve her vision. She’s right, according to Doctors of Optometry Canada (DOC) whose experts say iritis can be treated with eye drops if caught early through an eye exam by a doctor of optometry. 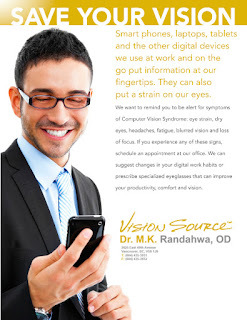 Computer vision syndrome (CVS), a common condition condition caused by increased computer, tablet and smart-phone use. It is associated with dry eye disorders. We also know that computer uses blink less than normal. A new study published in the journal Optometry and Vision Science examined whether visual symptoms following computer use were associated with either less blinking or a more incomplete blinks. They also examined whether increasing the blink rate would reduce CVS symptoms. Read more.